The Mountain Brook High School Lady Spartans won the first Class 7A state volleyball championship in AHSAA history on Thursday. The Lady Spartans downed Hoover 35-26, 25-20, 18-25, 25-10 Oct. 30 at the Birmingham CrossPlex to capture the title. 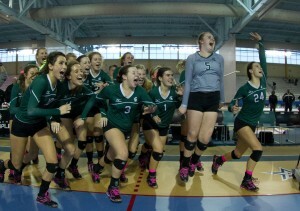 It was also Mountain Brook’s first volleyball state title. Coach Haven O’Quinn’s Spartans (49-10) jumped out to a 2-0 lead in part due to the play of outside hitter Sara Carr. The junior outside hitter finished with 16 kills, 14 digs and three blocks to earn MVP honors. Emmy Kilgore had eight kills, Payton Selmon, Abby Garrett and Kendrall Crumbaugh added seven each. Setter Sara Chandler Mitchell also handed out 38 assists and Smith had 21 digs. Hoover (38-9) , coached by Chris Camper, was led by Ali Lowe’s 13 kills. Nora Webster added seven. Jamie Gregg had 18 assists and Olivia Portera had 16 digs. Hoover and Mountain Brook were the first two Birmingham schools to meet in the large school state finals. Both were 6A last year. Players named to the Class 7A All-Tournament Team were Sara Carr, Mountain Brook (MVP); Sara Chandler Mitchell, Mountain Brook; Julia Smith, Mountain Brook; Ali Lowe, Hoover; Kathryn Cather, Hoover; Abby Hutchens, McGill-Toolen Catholic; Haley Hop, Bob Jones.